Based in Bristol, Lost and Grounded Brewers began brewing in the summer of 2016, following a year of preparation. Fascinated by the precision of German brewing and the idiosyncratic nature of Belgian beers, Lost and Grounded have a 25HL brewhouse from Krones, located in Freising, Germany – home of Weihenstephan. Here, the brewhouse includes a traditional lactic acid propagation plant, giving brewers the ability to naturally produce “sour” wort with a special strain of lactic acid bacteria used to naturally adjust the beers’ PH throughout the brewing process. This traditional German brewing method also gives Lost and Grounded added flexibility when fine tuning their range of beers. From the brewery’s core range, Hop Hand Fallacy is unfiltered and bottled with a striking label designed by illustrator Alexia Tucker. 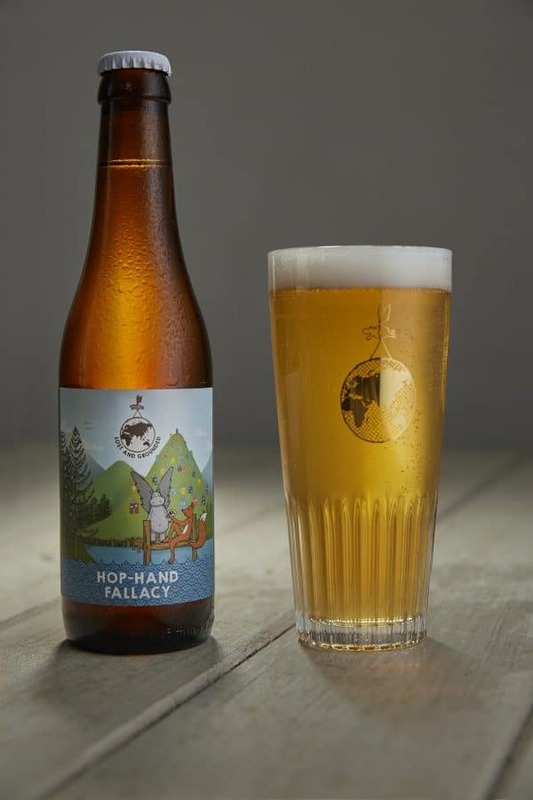 Lost and Grounded’s take on a traditional farmhouse ale, Hop Hand Fallacy is brewed with a base of Pilsner malt and oats to provide a biscuit-y base, boosted with Brewers Gold and Crystal hops alongside orange peel and coriander (not unlike Einstök’s sensational white ale). On pour, Hop Hand Fallacy has a hazy yellow body, capped with a foaming white head. A slightly spicy, earthy nose is joined by aromas of citrus – particularly orange – plus light, doughy malt notes and prominent coriander joined by a whisper of clove and pepper. On the palate, the beer has some Belgian wheat beer characteristics, with soft carbonation and mild acidity. As far as flavour is reserved, prominent notes of orange and coriander are backed-up with some mild spice, Saison yeast, grass, honey and underlying clove which leads to a dry finish with refreshing bitterness. Further information on Lost and Grounded can be found here.